Tony D. Sampson. 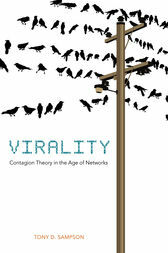 Virality: Contagion Theory in the Age of Networks. University of Minnesota Press, 2012. 235 pp. Claire Barber is a doctoral candidate at the University of Illinois at Urbana-Champaign. Her dissertation, entitled “Modern Cognitive Styles: The Aesthetics of Autism and Modernism,” proposes that a new literary genre emerges in the late twentieth–century whose texts employ similar avant-garde aesthetic and poetic strategies while representing a form of information processing that differs from conventionally accepted cognitive styles.